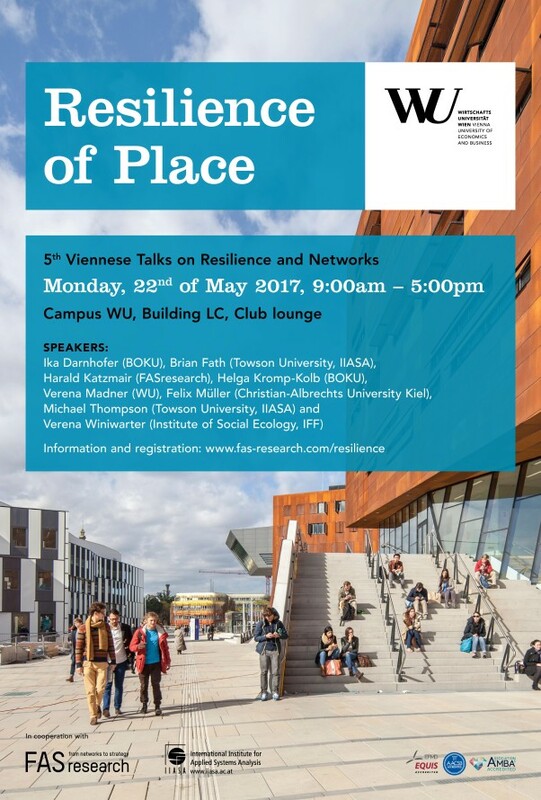 The 5th Viennese Talks on Resilience and Networks with the title: “Resilience of Place: Networking in an age of division” will explore and discuss the important issues related to resilience of place, in particular, the apparent divide between urban and rural experiences and perceptions. Progress toward sustainable development requires contributions and coordination from both locales. Participation is free, please register at http://fas-research.com/resilience/During the morning session speakers will present their talks. After lunch break we will continue with an interactive participatory impact analysis. The 5th Viennese Talks on Resilience and Networks are organized by Brian Fath (IIASA and Towson University), Harald Katzmair (FASresearch) and Fred Luks (Vienna University of Economics and Business).